ZXJ15 Case packer integrates functions of empty boxes /bags rejection, products dividing, stacking, case opening, products pushed into case, case closing, discharging, fully automatic. This machine adopts international famous servo system and PLC. It is operated by touch screen and can communicate with upstream and downstream machines and easy for different products change-over.All the motors ?5.5KW are of Grade 2 Energy Consuming according to international standard. 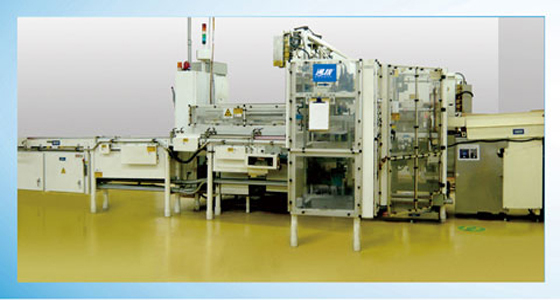 YZX series fully automatic case packer is mainly used in the end of toothpaste, soap, cosmetic, medical, food and shoeshine production lines to complete the automatic case packing and sealing of carton shape products. This machine uses PLC, servomotor, VFD and touch screen etc. advances technology, which can accurately control the movement of machine and it is convenient to operate to meet different requirement. The products come out from the carton packing machine, and enter the high speed case packer via the conveyer belt. In the case packer, the machine via carry & pull, Z carriage, X impelling, Y impelling & case packing, big-tucker, small-tucker, sealing and 90 degree rotation etc working processes. All the processes are automatic.All the motors ?5.5KW are of Grade 2 Energy Consuming according to international standard. ZXJ Series Semi-auto Case Packer? It’s a semi-auto case packer which can automatically stack the products, push them into the case and discharge the case out, but needs manual case opening. This machine uses world famous PLC and touch screen. This machine can meet CE safety standards and widely used for product packaging in soap, toothpaste, food, pharmaceutical, chemical and electrical fields.All the motors ?5.5KW are of Grade 2 Energy Consuming according to international standard.